Trying to find the right size image for parallax can be a little frustrating. The image may look great as a standard background image, but then as soon as you select “Use Parallax Effect”, the image gets blown up and nothing looks right. To avoid this aggravation in the future, you need to understand what parallax is and what is happening to the image when it is put in parallax mode. Today, I’m going to dive deep into the ways parallax works with Divi. I’ll explain exactly what happens when you use the two different parallax methods, what size image is best, and I’ll even throw in some custom css hacks to position your images just how you want them. In regards to web design, parallax is a term used to describe an effect that gives the perception of life-like distance and motion using a kind of two-dimensional animation. This is accomplished by changing the scrolling speeds of different elements on a webpage to create the illusion of distance while viewing a fixed point. The technique has been around for a while in places other than the web. Remember Super Mario Brothers? If you have ever played video games in the 80’s (Nintendo NES), most of the games used this technique to give the impression of movement using only 2d imagery. The items in the forefront moved quicker than the trees/mountains/clouds in the background. Thus creating a more life-like motion. This effect is much like the True Parallax method in Divi. Except the movement is vertical instead of horizontal. 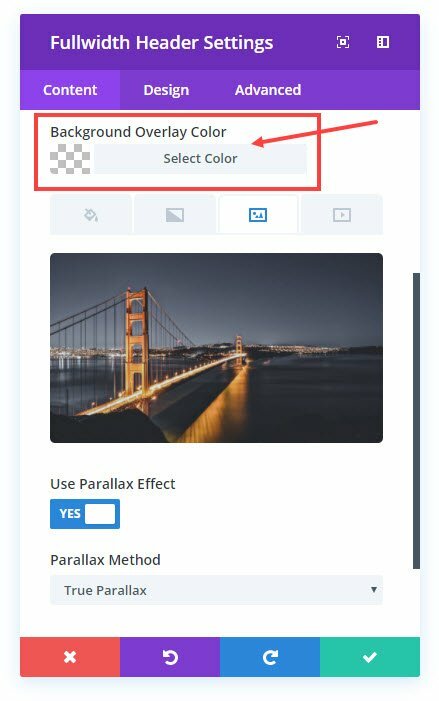 With Divi, Parallax is really easy to deploy on any background image within any section, row, column or module. 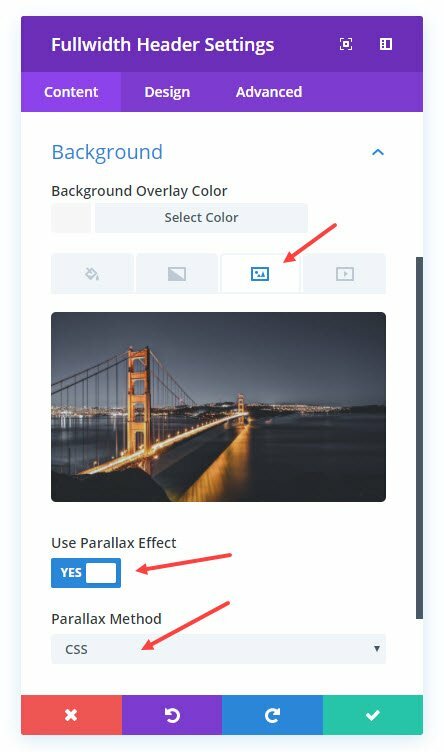 All you have to do is set the Parallax Effect option to “YES” and then select your Parallax Method (CSS or True Parallax). The CSS Method is one of two methods you can choose for your parallax effect. You can probably guess what is happening just by testing this method out on your site. It is referred to as the CSS Method because it only uses CSS to create the effect. This method uses CSS to fix the background image in place while the other elements on the page scroll normally. This gives the impression that the content is moving in front of the background image. What Happens When Parallax is Enabled in Divi? This can be frustrating if you don’ t understand what is going on behind the scenes. Therefore it is helpful to know exactly what is happening to the image when parallax is activated. What Happens When CSS Method is Selected? Since the background-size is set to “cover” with a height and width of 100%, the image will always “cover” every part of its container. In this case, the container is the browser window. This means that parts of the image will become hidden behind other content sections since the background image will always keep expanding and contracting along with the browser window size. Imagine this is a regular background image added to a header module at the top of a page. The aspect ratio of the image is correct (1920×1080) and the size of the image covers and fits in the section nicely without any overlap when viewed on a 1366×766 screen size. The white area below the image is the rest of the content on the page. Now this is what happens when you select parallax for your image. As you can see, the image expands both vertically (to reach the bottom of the browser window) and horizontally (to keep the aspect ratio of the image). The black square represents your monitor so everything inside the black square is what the viewer sees. I made the white content section at the bottom semi-transparent so that you can see where the background image sits hidden behind it. There the image stays fixed while you scroll and other elements move up and down in front of the image. What Happens When True Parallax Method is Selected? Notice the two numbers in the transform property. These two numbers control the positioning of the background image. The first number (0px) positions the image along the x axis (horizontally). Since it is set to 0px, the image won’t be moved. The second number positions the image along the y axis (vertically). Since it is currently 220.5px, that means the image is being pushed down the page 220.5px. Also notice the height value (960.8px) is greater than the height of my browser window (766px) by about 200px. This is to accommodate for the image being pushed 220.5px past the bottom of the browser window. When the True Parallax Method is selected, you may have noticed that your image gets blown up even more than the CSS Method. This is because the position of the image is stretched an additional 30% of the browser height. Remember our regular background illustration? As you can see, the image is pulled a bit more past the bottom of the browser window. This browser window is about 1080×700 so it is fairly small, but I wanted to show you what is happening on a smaller desktop window. Why Does True Parallax Stretch the Image So Far? Well, my best guess is to accommodate for larger screen sizes. Once the browser window reaches a 1920×1080 screen size, the background image no longer extends past the bottom of the window anymore and fits nicely. If I scroll down the page, the translate position value (the 220.5px in the above example) increases, moving the vertical (y-axis) position of the image down the page. If I scroll up, the translate position value decreases, pulling the image back up the page. But because the image is being pushed down and pulled up at a different speed than the other elements when scrolling, you get the True parallax effect. If you are looking to use the parallax effect on your site, choosing the right background image is crucial. You don’t want the background to be too cluttered or distracting. But on the other hand you don’t want it to be a boring side note either. Avoid Distracting Photos. Images that have too much going on with create confusion and distract from the content. Make sure your photo matches the theme of your site. Your site should be telling a story. This parallax image (like the rest of your images) should fit in with the theme. Keep it big and simple. Remember, your parallax image will be viewed on smaller screen sizes as well. Make sure the details of the photo aren’t so small that they can’t be recognized on smaller devices. Make It Interesting. There are way to may photos out there to settle for something boring. Take the time to find one that engages your audience and grabs their attention. What Size Parallax Background Image Should You Use? This one is a little tricky to answer. There are no one size fits all parallax images. In fact there is no one size fits all anything in web design, at least not since responsive design came around. But, even though I may not be able to give you a firm rule, I can offer some general guidelines for picking the right size parallax background images with Divi. Since the most popular screen size is about 1366×766, I would definitely make sure all background parallax images be at least this size. But because of the popularity of larger monitors, I would go with a bigger size like 1920×1080. This will make sure users see a high quality image on larger desktops. The problem with having an image with the dimensions 1920×1080 is that rarely will you ever have a visible section that is 1080px in height. So you can bank on the bottom of those images staying hidden. If you still don’t have enough of the image showing, I would suggest cropping the top part of your image and then upload it again. This may help. Also, try to select photos that have insignificant content at the bottom of the image and the more important content at the top. For headers, you should only expect to see the top 700px of the parallax image. 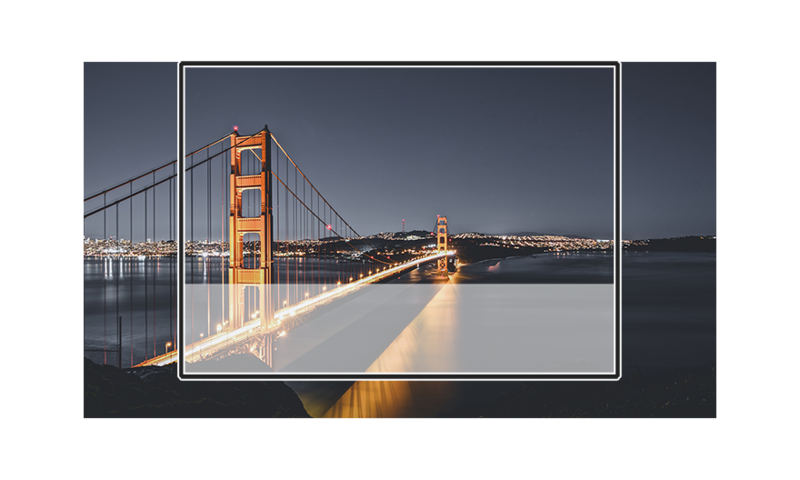 Make sure you leave enough space around your content to expose the background enough so that you can get a full picture when the section reaches the center viewpoint of the user. Use the padding to your advantage. If you are going to use parallax, don’t let your users get confused and have to scroll up and down just to see what the image is. Better to show them the first time around. If you are using the CSS Method, you can expect to see more of the bottom of your background image (depending on how much space you have). I would try cropping the bottom of the photo to show more of the top in these sections. If you are using the True Parallax method, you are going to see mostly the top of your images, so I would treat them like your headers. 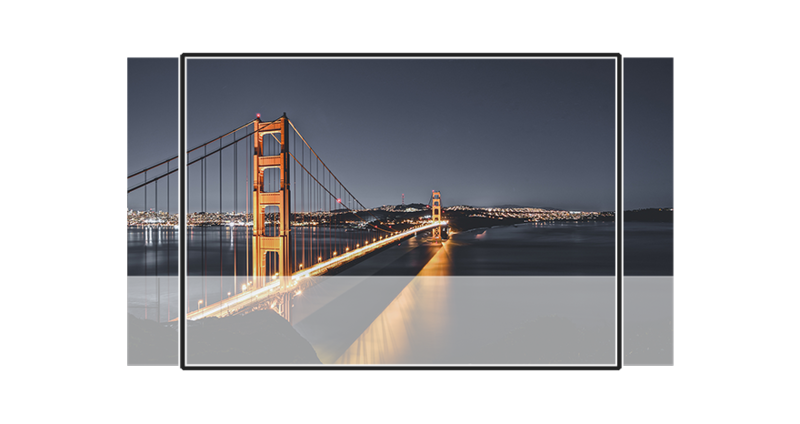 Here is an example of True Parallax background images at the top, middle, and bottom of the page. This type of image of a bridge works well because it has a nice focal point off to the side and the bottom of the image isn’t as significant as the top, so the message is never lost on the user. Here is the same page using the CSS method. You can really see the fact that the background image is fixed and expands to the browser window. It even looks like it is the same image fixed in the background the whole time. If you still aren’t satisfied after you have searched for the perfect image, added necessary padding, and cropped it, you can always resort to some hacking. 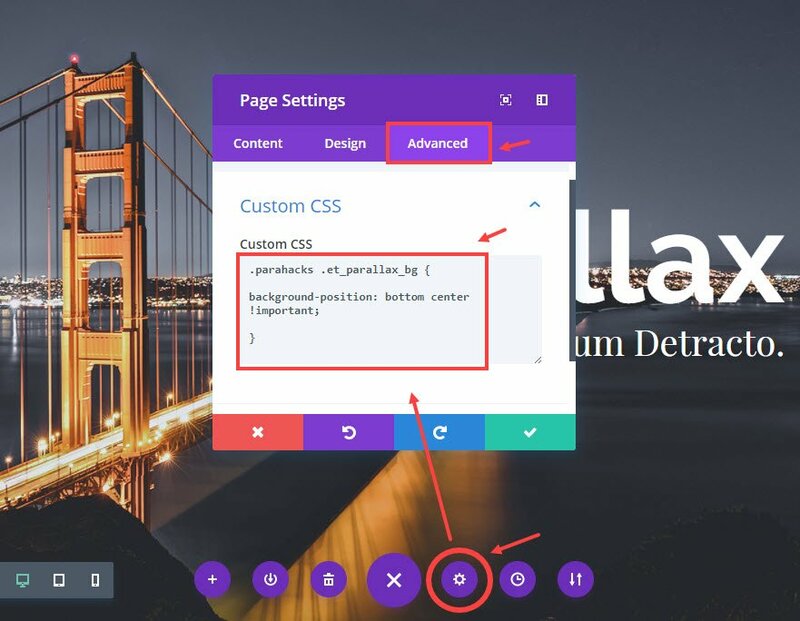 If you want to change the position of the parallax background, you can use the css selector “.et_parallax_bg”. Here is the default css that positions the image for the parallax effect. If you notice, by default, the background position property for the css parallax method is as follows is set to “top center”. But if I wanted to change the original position of the background image, you can adjust the background-position property values. If you want to keep your Custom CSS condensed to a certain image and not have it effect all your parallax background you will need to add a class to your section so we can identify in the css which background we need to customize. Go to the section settings, under the Advance tab, and enter a CSS Class called “parahacks”. Now go to Page Settings and select the Advanced tab. 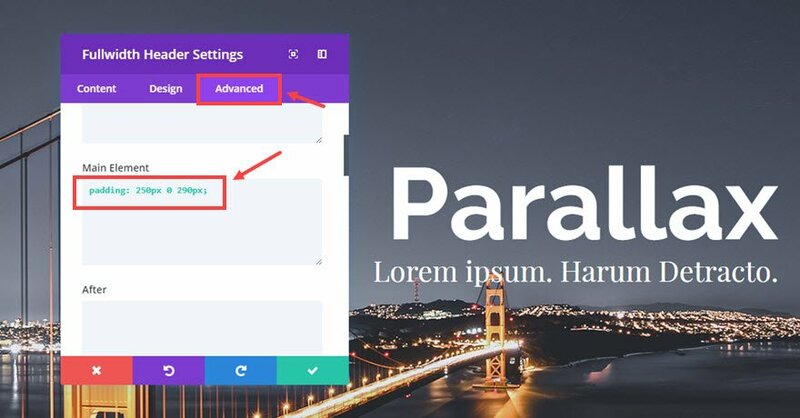 I sincerely hope this guide was helpful in gaining a deep understanding of how parallax works with Divi. Thankfully Divi does almost all of the heavy lifting in providing us with parallax functionality. The CSS method and the True Parallax method both create great life-like effects out of the box. However, it is up to us to find the right images and tweak them just right to make them work for our site. Go for it! I bet you will create something amazing. Look forward to hearing from you in the comments. It is actually possible to do parallax in pure CSS – it’s just a bit messy. Is parallax effect works on iPad/iPhone? i don’t think either of the ET implementations work on mobile devices – at least from my experience. however, i have been on sites where it does work, so i’m not sure how they are doing it. I really have a hard time to make it look nice with Divi on the phone. Now if I use the CSS fixed parallax the background is awful, blured and zoomed in. If there is a way of close it on the phone or an other way around it I’m greatful. Great to see such a detailed post about parallax in Divi. Looking forward to putting some of these tips into practice. I prefer to use at least two sizes: One for desktop, one for tablet, etc.. Then, by using Divi’s show/hide toggle, the appropriate size will display depending on what device the viewer is using. If I am designing a site aimed at creatives, my desktop image size will be large: 2560×1440. For tablets, I use 1024×768 (I am referring to fullscreen backgrounds, here). I avoid parallax (I have found a noticeable lack of sharpness with Divi’s presentation of parallax images vs. non-parallax). Great Suggestions, Will. I like the idea of using two sizes. Great article with bonus points for working in the Super Mario Brothers reference. To add a thought to both the article and Will’s comment, I agree image quality and selection are very important, but developers should remember to always optimize images and test pagespeed. This is particularly important when using large format images, like with parallax. Excellent tip, Doug. I agree. There is a fine line between image quality and file size that we should always aim for, especially for large images. Great post Jason!! Super useful! Are there any hacks to make it work on mobile? Hope all is well in Australia! I think I found a hack that might just work on mobile phones.This will apply a fixed background image onto the body of the page you want it to appear. Put this code in the CSS settings on the top right of the Divi page when editing from the back-end. You will need to make one of the main sections transparent or translucent so you can see the fixed body image. Hope this helps. Apply a fixed background image onto the body of the page throughout the entire site. make sure the options “stretch Background image” and “fixed background Position” is selected. Add a standard section to your page, give it a height, and turn on background transparency. Seeing more people are viewing on mobile devices, it seems a shame to have to upload larger images (thinking load speed etc) to cater for the large screen viewers. It would be great to know photoshop image quality settings when you save for web as a final JPEG. 70% quality, or less to get a decent image quality and smaller file size that will render well on all devices. and 2 more sentences use “passed” when you actually wanted to use “past” if I’m not mistaken. Thanks Jason, great post and this should go to the basic documentation of Divi in “Tutorial Collection”. Great article. Very in-depth and helpful. Question: is there a benefit to using css to apply padding instead of adding the padding directly to the module settings (using the padding boxes)? Thanks. I’ve been struggling with the parallax and image size issue for a while. Post helps to clear up many of my questions and problems. Hi, is there any hack to get the CSS parallax effect work on mobile? Again you will need to make one of the main sections transparent or translucent so you can see the fixed body image. Hope this helps. Great post!! I’ve been struggling to understand this for awhile now. Thanks for the clarification! Thank you so much, Jason! I’m new to Divi (and loving it! ), and this has been the clearest explanation I’ve found on the difference between True Parallax and the CSS Parallax in Divi. I also greatly appreciate the suggestions about image sizing. Divi 3 is so vast, has so many options for design, that it can be quite daunting at first. I much appreciate your explanations and the possible CSS hacks here! – Is there a way to apply this to only individual slides? – Can it be set up so mobile ignores this particular CSS, as setting a custom position (e.g. center -220px) shows the background padding on mobile?